Last year, Yung Lean was all but written off as a stylist for the new influx of Hip-Hop emcees with his poor attempt at amalgamating a bevy of trendy sub-genres on Warlord. That album's implied declaration was that Lean, the meme rapper known for associating with the Vaporwave a e s t h e t i c, was nothing more than a two-hit wonder. Previously, it was 'Kyoto,' but Warlord's stunning lead single 'Hoover' proved there was more left in the tank. Unfortunately, not enough to get the LP from stalling out rather abruptly. By all accounts, Stranger wasn't on mine, or many non-Sad Boys fanatics' radar. Right now, I couldn't even tell you what Stranger's lead single was. And what's a Lean project without that one tremendous cut that has fans flocking for the hype? Turns out, a pretty damn good one. Without unreachably high standards brought on by a spark, or, more significantly, without caring desperately for fame beyond cult status, Yung Lean inadvertently crafted his best work yet. It's not exceptional by any stretch of the imagination, as Lean still suffers from the same setbacks that drew thousands to mock him, but the creativity in the production and the disburdening in Lean's voice allow Stranger to flourish where he previously failed. 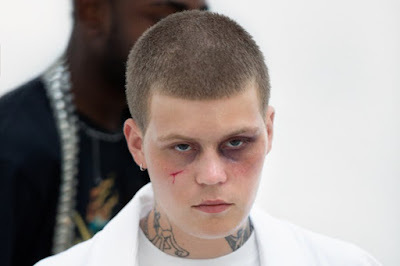 Even though he switches his style rather precariously, something that doesn't change here, Yung Lean's successes have always been the same. Outstanding production from the Sad Boys crew, namely Yung Gud, that incorporated the cold, harsh winters of Sweden with Americans hazy Cloud Rap or steeled Trap, all while Lean rhymes nonsensical braggadocio through syrupy flows. Stranger alters that formula, minutely, by seceding even further into the icy regions of Scandinavia. The fluttery synths dotting opener 'Muddy Sea' resembles, oddly enough, Bjork's Vespertine era. Tracks like 'Frosti' and 'Aurora' seem to evoke the same winter wonderland, whereas 'Pagan Poetry,' in retrospect, seems like a direct inspiration for the Sad Boys' dreamy experimentation. Huh. 'Muddy Sea' isn't an abnormality either, as Stranger throughout is far more homegrown than any Lean project that came before. 'Metallic Intuition,' 'Hunting My Own Skin,' and 'Iceman' all directly embody that bitter beauty. It's because of this direct approach at neglecting the overseas influence that causes Stranger's success. There's really only two palpable comparisons, and that would be Post Malone and Lil Yachty. The former can be heard on tracks like 'Red Bottom Sky' and 'Yellowman,' where Lean swallows himself in the sentimental, but wholly slimy, Hip-Hop/R&B pairing Malone granulizes. The latter on autotuned diddy's like 'Push / Lost Weekend' and 'Silver Arrows,' where off-kilter synthesizers take on a bubbly, aquatic sound. But don't get it twisted, Lean's own style prevails, especially towards the latter half of the LP after escaping the grave that was being dug for Stranger with a handful of mediocre middling tracks ('Salute / Pacman,' 'Drop It / Scooter'). The catchy bounce and light-hearted charisma of 'Hunting My Own Skin,' the odd but oddly entrancing tone of the interlude 'Snakeskin / Bullets,' and misshapen love letter of 'Agony' just some of the late standouts. The latter, along with 'Skimask,' represent Stranger's best material. A key distinction to make; they couldn't sound more dissimilar. Meaning Stranger, and Lean, succeed at the various emotional states, whether reckless or recluse, they plunge themselves in.